Compare to iOS UI Automation with Instruments, we can write Test code using Objective-C.
You can write test with SenTestKit(Old) and XCTest. It means you use both logic and UI tests. 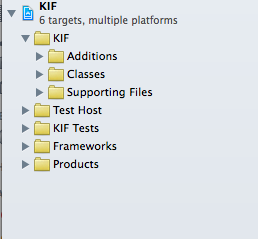 * As KIF author mentioned, KIF includes private API, so don’t include App compile targets. We should use only test target. Original code is static library style. Other people explains how to download with git, so I explain how to use codes itself. KIF/Additions, KIF/Classes are core codes, please copy them. Especially, you use XCode6 above, Precompile header is not required, so you need change for it. KIF is originally static library so, you need to change for it. Source compile should be fine. Let’s start Test. To find UI and touch, accessibilityLabel is useful for KIF. accessibilityLabel is name we can add to UI. In Interfacebuilder, you can add it as property. Only tap left top position. We can use XCTAssert series. The point is calculated in methods. Please look at source codes.